Why use different default views based on navigation hierarchy? What are the different levels that a default view can be set? 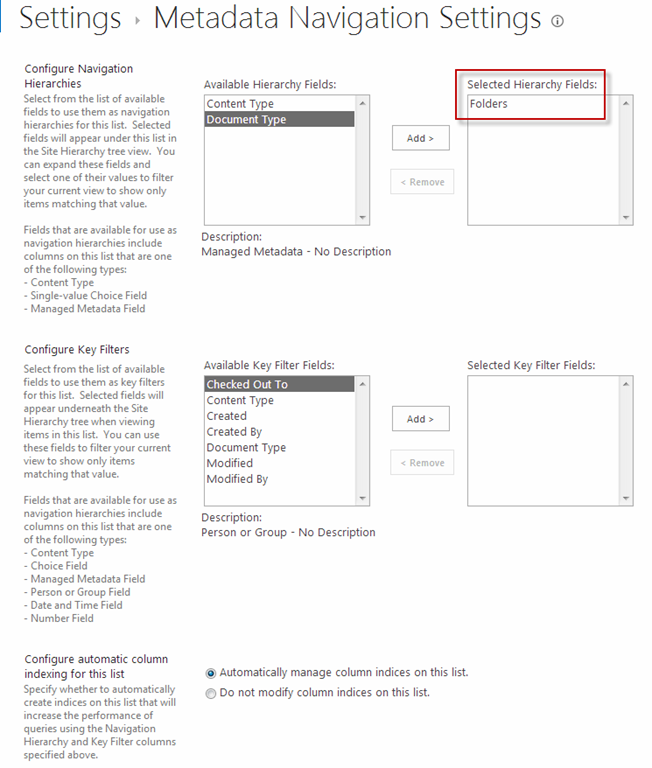 This article describes the different methods and techniques available for configuring default views at different hierarchy levels (folder levels) within a SharePoint library. 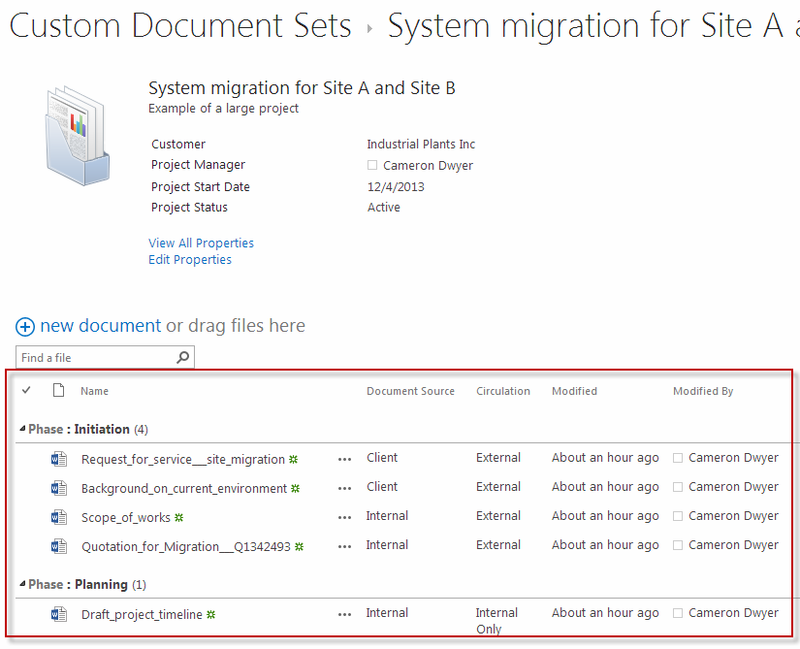 This article presents the options and how to implement them in SharePoint 2013. 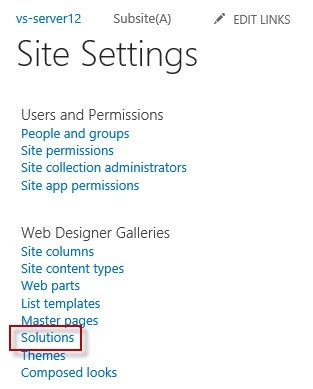 All options/settings discussed also apply to SharePoint 2010. People use libraries for many different purposes. If you are storing different types of documents in a library (especially if you are using different content types) the properties (or columns) of information may be specific to the different types of items in your library. Allowing the default view to be set at different levels in the navigation hierarchy means that you can show the user views that are specifically customized for showing the data in that location. This is really where all the action is at. We’re talking about what happens when the user navigates either from the root level of a library into a folder, or from a folder into a lower level folder. Usually we group items in folders for some logical reason, and based on that logic it is reasonable to expect that we might want to show a different view of the items in that folder. We actually have a few options available to us at this level depending on the types of folders that have been implemented. Let me bore you with some details about folders that may assist with some of the terminology used through the rest of this article. 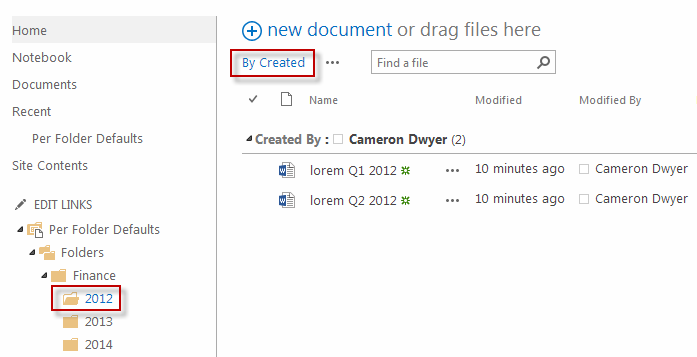 Folders are a content type in SharePoint. 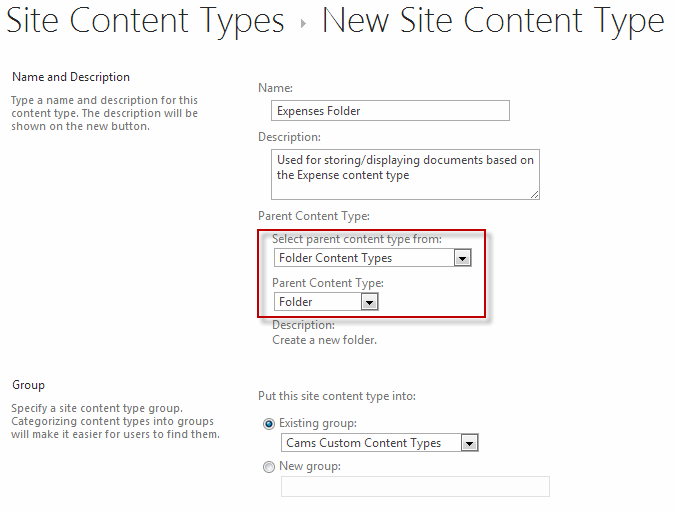 Through the SharePoint UI you can create your own custom content types that are based on the folder content type (I’ll refer to these as custom folder content types, or just Custom Folders). 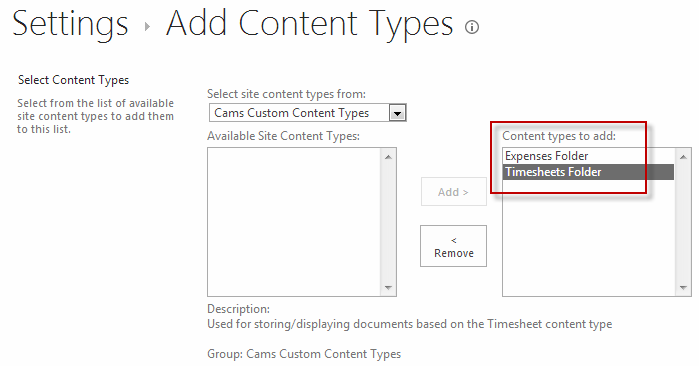 Then there’s Document Sets which are based on the folder content type (just like a custom folder content type) but contain a lot of extra intelligence that SharePoint gives you out of the box. 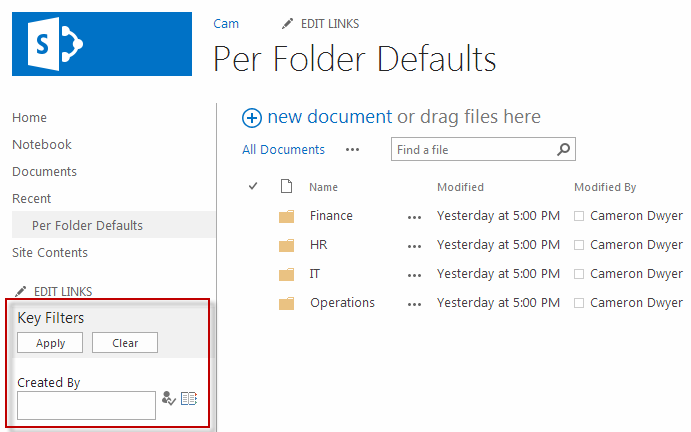 In the same way you can create custom folders by extending the base Folder content type, you can also create your own Custom Document Set content types by extending the standard Document Set content type. The techniques for applying a default view to a folder is different for Folders, Custom Folders, and Document Sets, so we will discuss them one at a time. This article will go through each of these different navigation hierarchy levels and explain with examples how default views can be applied and what it looks like. This one is as simple as it gets. 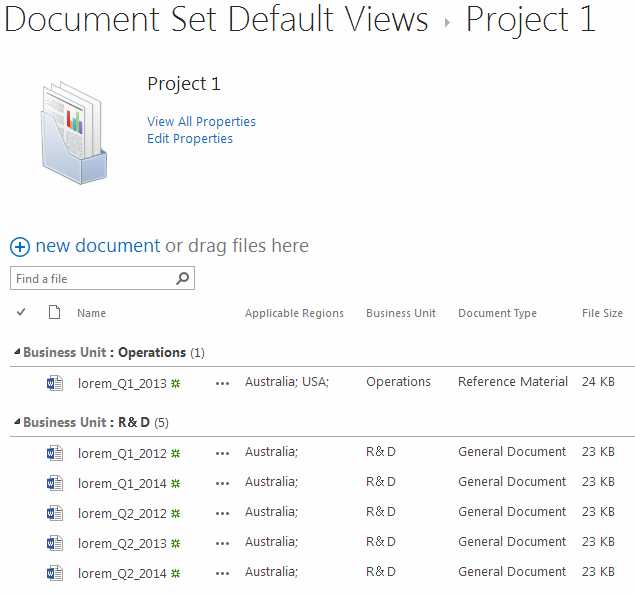 Every list or library in SharePoint contains one or more views. One of those views can be set as the default. You do this directly on the view settings page. Scroll down to the Views section, where you can see all views for the library and also which view is currently set as the default. To change the default view, click the name of the view you want set as the new default. This will open the view settings page. Now tick the ‘Make this the default view’ checkbox. 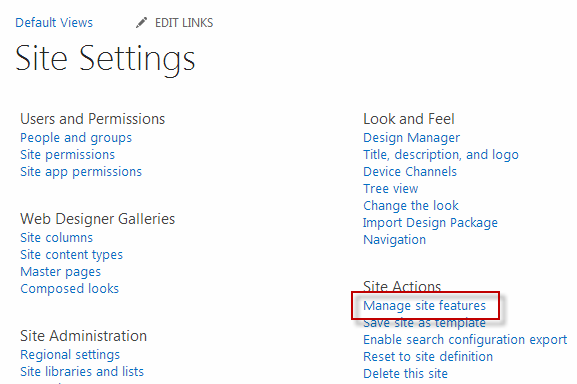 Save the changes and now navigate to the library in SharePoint and this time your selected view is displayed by default. Use this method when you want to show one view in the root of the library (when not in any folder), and a different view when inside any folder within the library. In my library I have only folders at the root level of my library (no documents stored at this level) so I just want columns for the title of the folder. When I go into any of the folders I want to see a different default view which shows me documents grouped by Project and also shows the Project Manager and Document Type. Ensure content type management is enabled for the library. This is under Library Settings | Advanced Settings. 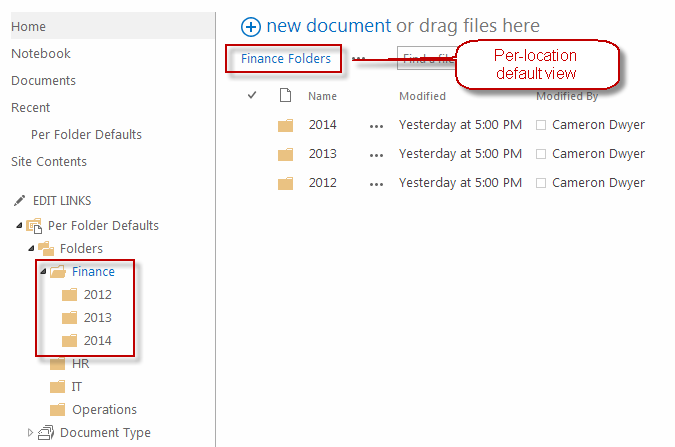 2 – Expand the Folders setting option and select ‘Show in this view: In the top-level folder’. Note: these options only become available once you have enabled management of content types in the library. Notice that Library View is designated to only show in Top-level and is set as the default view for the library. 1 – Set this view as the default view. Yes I agree this doesn’t seem right. You would expect this to replace the ‘Library View’ as the default view – but in combination with the ‘Folders: Show in’ option some unexpected magic happens! Read on. Now save the view and take a look at the view settings for the library. 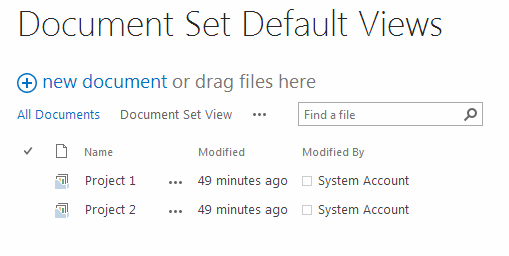 SharePoint has allowed us to have 2 default views! The show in column tells us that the ‘Library View’ view is the default for the Top-level (or root) of the library and the ‘By Project’ view is the default when in any Folder. That’s it – when you now navigate to the library you will see the ‘Library View’ and then clicking to navigate inside a folder will automatically switch to the ‘By Project View’. I was interested to see what would happen if I created another view at the “Show in folder” level and tried to set it as the default. I created a view called ‘By Manager’ and set it as default. 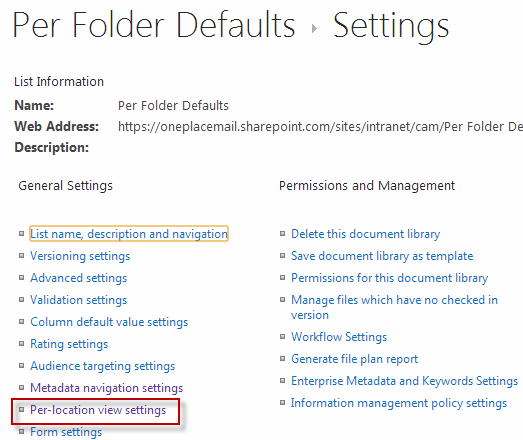 As you can see SharePoint is enforcing that I can only have 1 default view at the folder level and this is independent of the default view at the Top-level. Use this method when you want to be able to specify a default view at the root level of the library, and a different default view for each type of custom folder. Your intended design might not use custom folders, but consider using them so that you can use the different custom folder types to assign different default views. I have created a library to hold employee timesheets and expense claims. 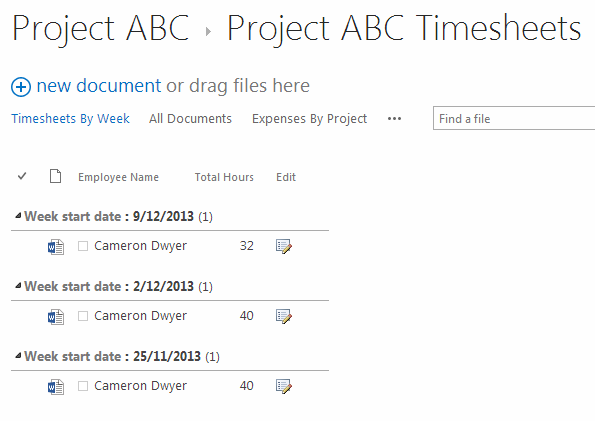 Timesheets and Expenses are two separate content types that I have created. 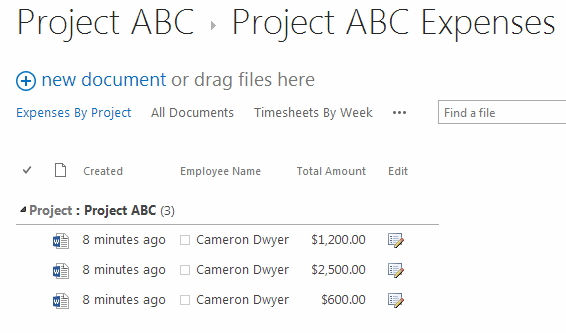 I want to create a folder per project in the library, and within each project I’ll create an Expenses folder and a Timesheet folder to store the actual documents. 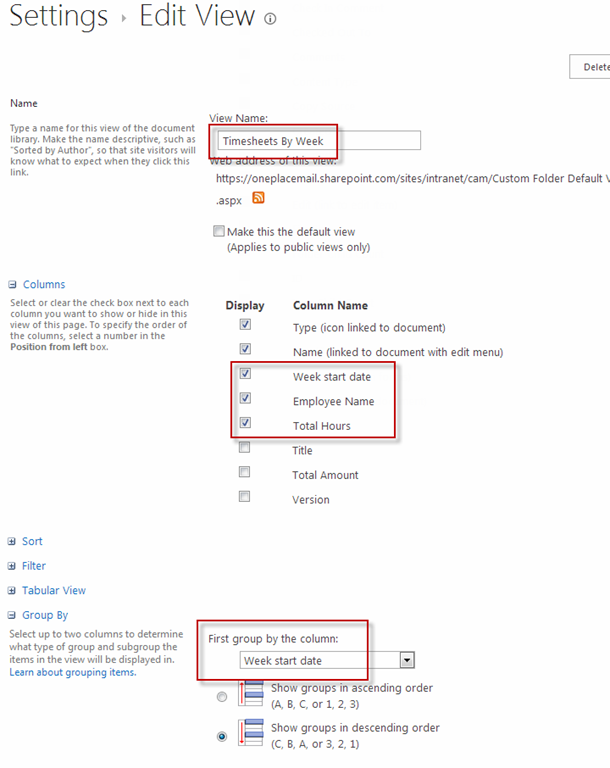 Since Expenses and Timesheets contain different columns I want a specific default view when browsing inside Expense folders and a different default view when browsing in Timesheet folders. Then the default view is changed when browsing into any of the Timesheet folders to present Timesheet specific information (such as Week Start Date, Employee Name and Total Hours) in a nice friendly format. A different default view is used when browsing into any of the Expense folders so you can quickly see Expense specific information such as the Total Amount of the expense. 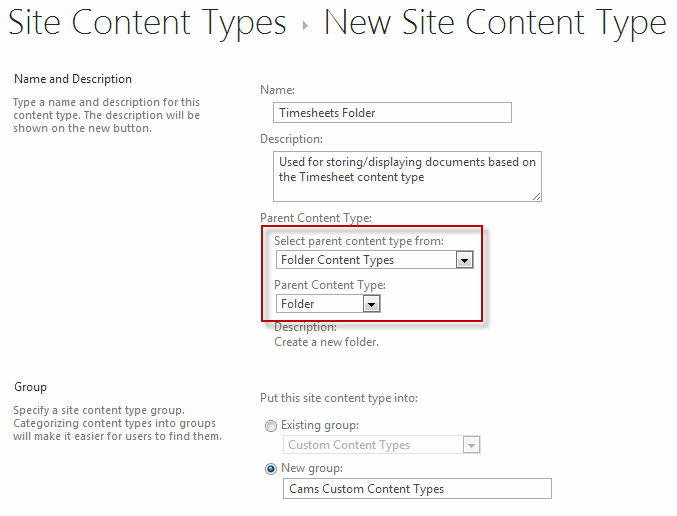 Create a new content type for the custom Timesheet Folder, setting the parent content type to ‘Folder’. 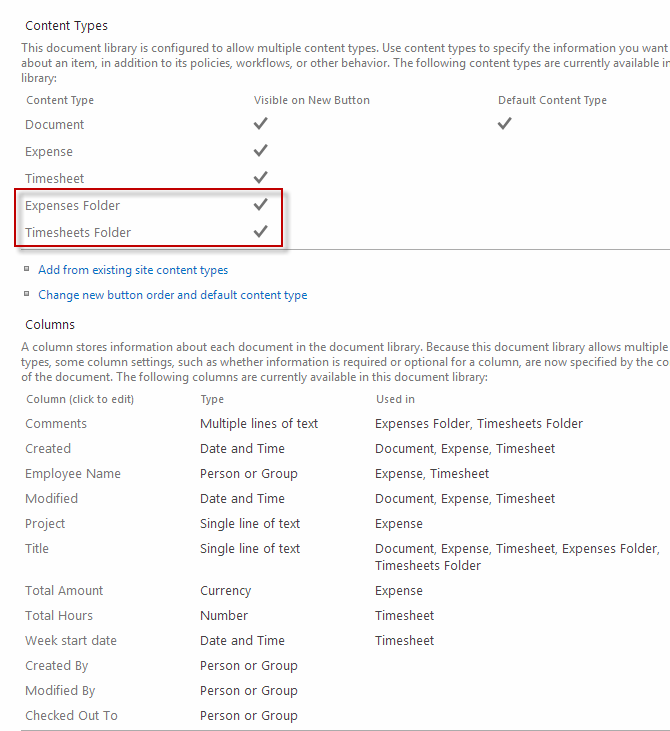 Create a second custom folder content type for the Expenses Folder, setting the parent content type to ‘Folder’. To get the default view applying to folders based on the custom content type of the folder, we go into the view settings for the view you want to make a default. So let’s start with the Timesheets by Week view. Notice the All Documents view is set to Show In All. 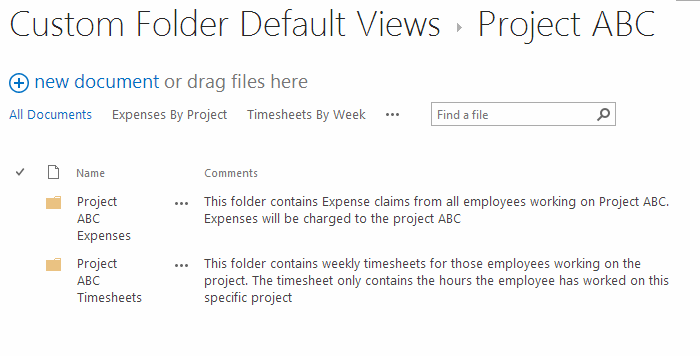 In this state you will find that the All Documents view will be the default (even within Timesheet and Expenses folders). We need to change the All Documents view so that it only used as the default at the top level. 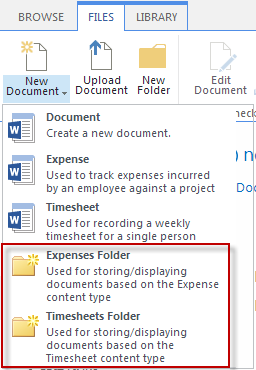 Edit the All Documents view, expand the Folders setting option and select ‘Show in this view: In the top-level folder’. The View settings should now look like this. Enough configuration, let’s start populating the library now. First we will setup the folder structure. Inside the Project ABC folder, I now have these 2 folders. Browsing to these folders now you should find that the default view is changing automatically as you navigate. Use this method when you are using Document Sets in your library and you want one view at the root level of the library and a different view when you are viewing the contents of a Document Set. The same default view will be used for all instances of the Document Set within the library. If you have multiple different Custom Document Set content types in the library, you can specify a different default view for each of the different Custom Document Sets. Navigating into any document set switches the default view so that we can present the document properties in a better way. 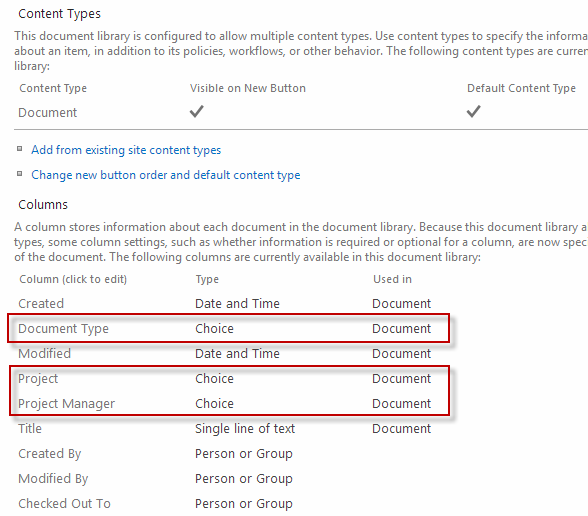 In the case of multiple Document Set content types you can have a default view at the top-level (customized for showing information about the document sets) then have a different default view for each of the different document set content types. In the following example I have a library with 2 custom document sets (Small Project Document Set and Large Project Document Set). 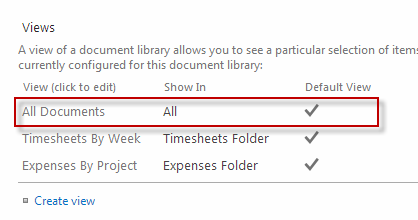 Once you’ve created your document sets (at least a few to start with), configure the All Documents view to display document set information that you want to see. We are done, navigating into a document set should now use this view by default. 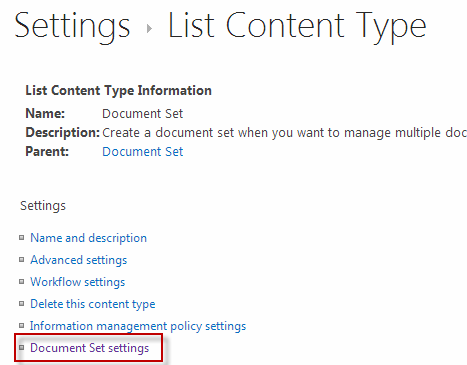 If you are using multiple custom document set content type, simply repeat the steps to assign Welcome Page View to each of the content types. Now on the library settings page you should see the per-location view settings link, the rest of this article is concerned with how these settings work. 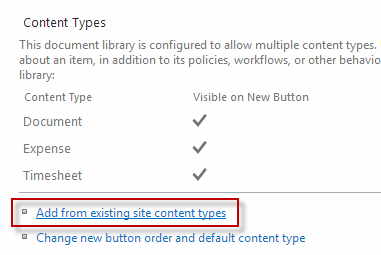 The expectation I had of SharePoint per-location view defaults settings was to be able to set a different default view on any folder in the library. 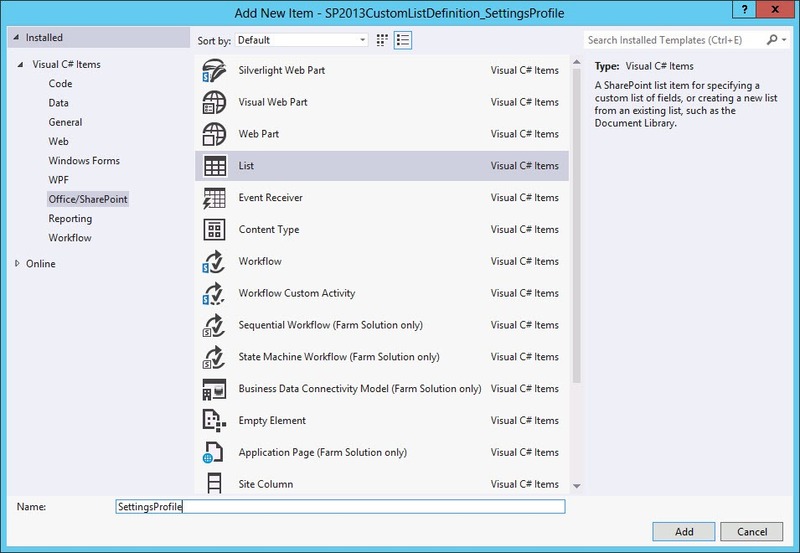 The settings page allows you to assign a specific view to be used as the default for any single folder anywhere in the library folder hierarchy. It goes even further any allows selection of which view to hide/show when inside any specific folder, and even further it allows inheritance of these settings down into subfolders. Unfortunately with all this promise and expectation I was left seriously wanting. 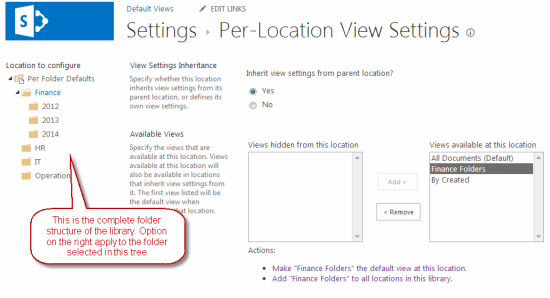 The per-location view settings page provides a tree on the left to browse (and select) any folder within the library structure. The options on the right side of the page apply to the selected folder in the tree. 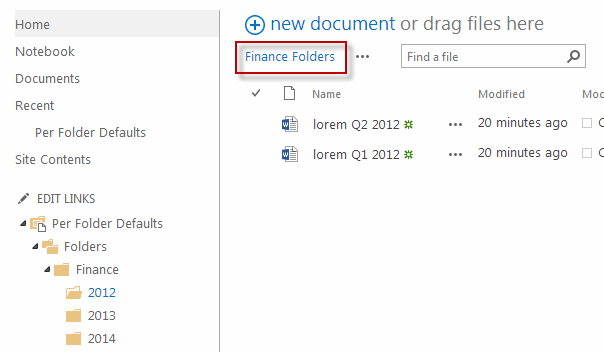 1 – They need the folders under the Finance Folder to be sorted reverse chronological (i.e. 2014 at the top, then 2013, 2012…). All other folders within the library need to stay sorted the way they are. So I’ve gone ahead and created a new view called ‘Finance Folders’ to show the Finance folders sorted as per the requirement, and also a view called ‘By Created’ to group documents by the Creator. 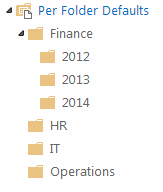 For my requirements, I wanted to set a default view at the Finance folder level to be a view called ‘Finance Folders’. So I select the Finance folder in the tree, then on the right side select the Finance Folders view in the list of available views. 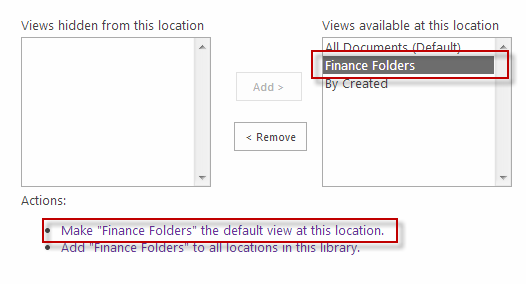 To make the Finance Folders view the default view (to use just within the selected Finance folder) click the ‘Make Finance Folders the default view at this location’ link. I was a little surprised that after making this change, when I returned to the library and navigated to the Finance folder nothing had changed. I was still looking at the All Documents view. SharePoint had just ignored my setting. What was going on, after a bit of experimenting I just could not get SharePoint to take on the setting. I also tried the other obvious option available to me on the per-location setting window. I removed all views from the Finance folder except the one I wanted to use as the default view. Save those changes and head back to the library filled with anticipation… no change. I had to scratch my head. What’s the point of per location defaults if they don’t work at the folder level? That just leaves the root level of the library and I have been able to set a default view at this level since before SharePoint was called SharePoint. It seems the per-location view settings only work if the library is configured to use tree view navigation (Library Settings | Metadata Navigation Settings). If you aren’t using the tree view style navigation these per-location defaults are just ignored. Ok, so I’ve accepted this limitation, after all I did have to activate the Metadata Navigation and Filtering feature to get it available in this first place. So I’m going to move on and see if I can get a workable solution by switching the navigation of this library over to using the tree. I was expecting to find a simple on/off setting somewhere to switch the navigation over, but it turned out to be a bit more cryptic than that. In the library settings click on the Metadata navigation settings. I looked over the default settings and they seemed to be exactly what I wanted. A navigation tree where the navigation hierarchy is driven by the Folders, with no Key Filters configured. Perfect, click Ok and back to the library. I see no navigation tree. I go back to the settings, maybe it needs at least one key filter configured, so I tried adding the Created By field as a key filter. This time I see something different when I browse the library, I can now see the filter. But still no navigation tree. Is it because my Managed Metadata service has a problem… no. Is it because I haven’t enabled the Enterprise Keywords column on this library… no. Is it because my items don’t have any managed metadata columns… no. 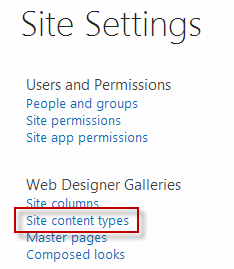 Is it because I haven’t created any items and actually assigned values to managed metadata columns this is causing SharePoint to suppress the tree… no. It seems that you only get the navigation tree if your selected hierarchy fields includes another field in addition to Folders. Just including Folders (which is the default) isn’t enough to get the navigation tree to show. Now with the Document Type column added to the navigation hierarchy when I browse to the library I finally see the navigation tree. Unfortunately I’m also stuck with the Document Type as a navigation node and I can’t find a way to get rid of it without losing my navigation tree again. The solution is losing appeal fast by this stage, but we’ve come this far so we might as well see if the per-location defaults actually work now we have managed to get the navigation tree visible. If I click on the Finance folder in the navigation tree then I do get my Finance Folders showing as the default view, hooray per-location defaults do work. A problem in the UI with what I’m trying to achieve is immediately apparent though. The Finance department wanted the folders under Finance to be sorted reverse chronologically, which we have now managed to do using the per-location default view, but we have changed the navigation metaphor to a tree and you can clearly see on the tree under the Finance folder that the subfolders and they are in the wrong order. Now the navigation metaphor has changed I’d expect users to get to the year folders using the tree and I don’t have any control over changing the order of them in the tree! I’m concluding that per-location view defaults is in no way helping me solve the business requirement of providing a custom view of folders at any level of the folder hierarchy. Let’s move on to the second requirement which was to use the ‘By Created’ view as the default view for the Finance/<year> folders. 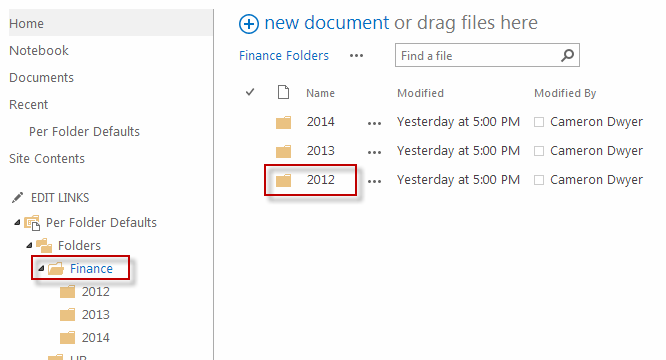 If I select the 2012 folder in the tree I can get the ‘By Created’ view to show by default. I don’t the ‘By Created’ view by default, again my per-location default view is just ignored. It seems the per-location view defaults only work if you select the location directly from the metadata navigation tree. The conclusion I’m drawing from this little foray into using the per-location view settings to drive folder level default views is that its use is limited and may actually create more confusion for users with inconsistent default views based on how the user navigated to the folder. Let’s hope we see some improvement to this area in future. 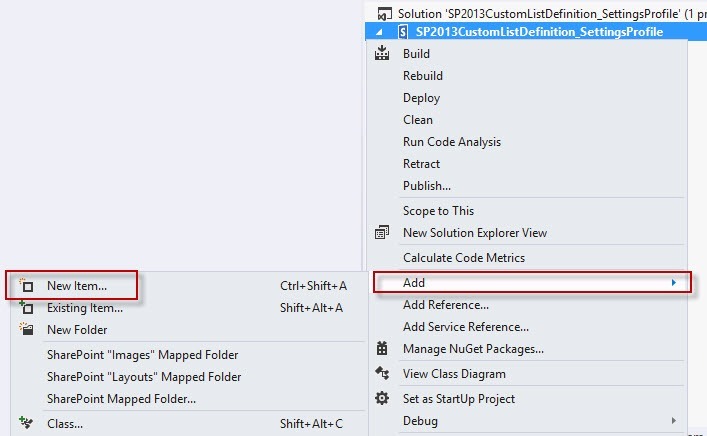 In this article you will learn how to create a custom list definition (not a list instance) using the Visual Studio 2012 visual designer with step-by-step with screenshots. 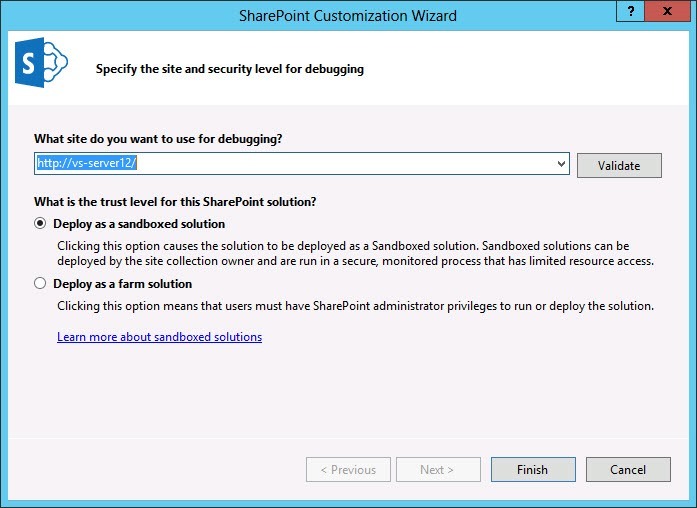 In the SharePoint Customization Wizard Prompt, configure the server to use for developing/debugging. If possible you will want to try and achieve a Sandboxed solution over a Farm Solution due to it’s ability to be able to be reused in more scenarios requiring less permission is the SharePoint environment. Provide a display name for the list. We just want to create a list definition, not an instance of the list; This isn’t an option so what we do instead is go with the “Create a customizable list template and a list instance of it” and we will make some mods to the generated project files to remove the list instance so we are just left with the definition. 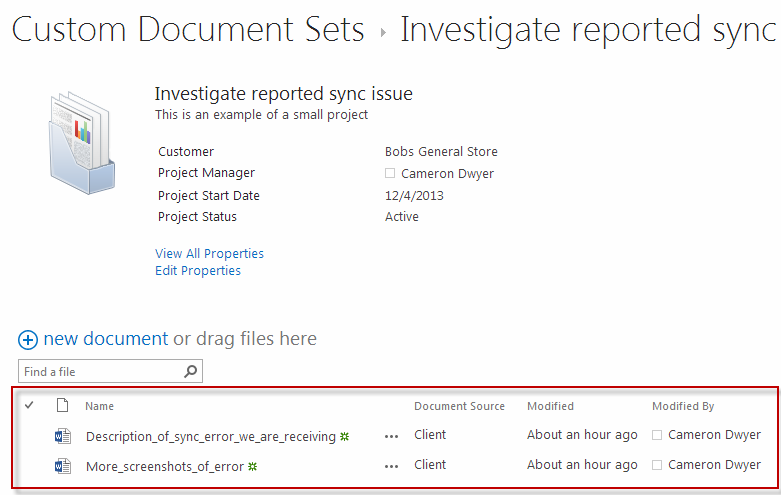 You should now see the list instance and definition files in solution explorer. 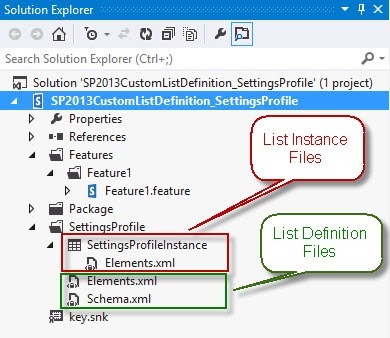 If you select the SettingsProfile in the solution explorer you will get the new List Visual Designer. Notice the “List” tab, this represents the instance of the list. 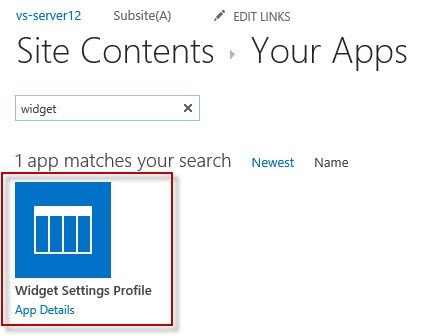 Since we only want the list definition, we are going to delete the list instance files from solution explorer. 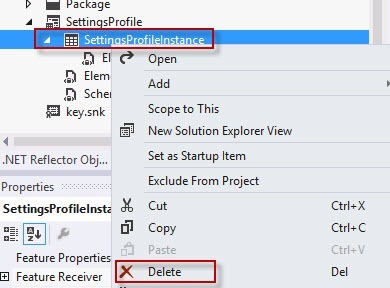 Select SettingProfileInstance, right-click and Delete. You should now be left with just the list definition, the “List” tab will now be greyed out. Just for completeness if you are following this through I’ve added a couple of columns to my definition. Here you can set options such as how the feature appears and it’s scope. For our purposes just confirm the items in the feature include just the list definition files. Once the solution has been deployed I’m going to navigate to my site in a browser and verify that the new solution has been deployed and the feature activated (by default the solution is deployed and activated, and the feature is scoped at a web level and activated). You should see messages in the Visual Studio status bar to this effect during the deployment. Everything is now is place for us to create an instance of the list from the definition, so I’ll create a new app and select our Widget Settings Profile app (list definition). 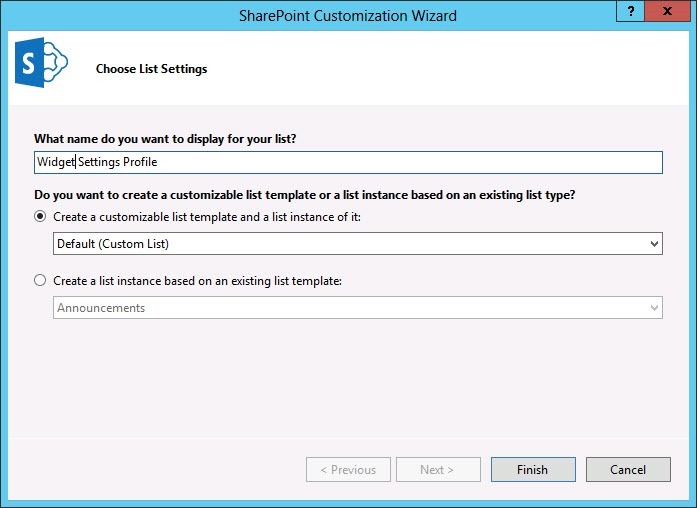 Provide a name for the new list instance based on our custom list definition. We can now create items in the list and we see our columns coming through that were defined in the custom list definition. 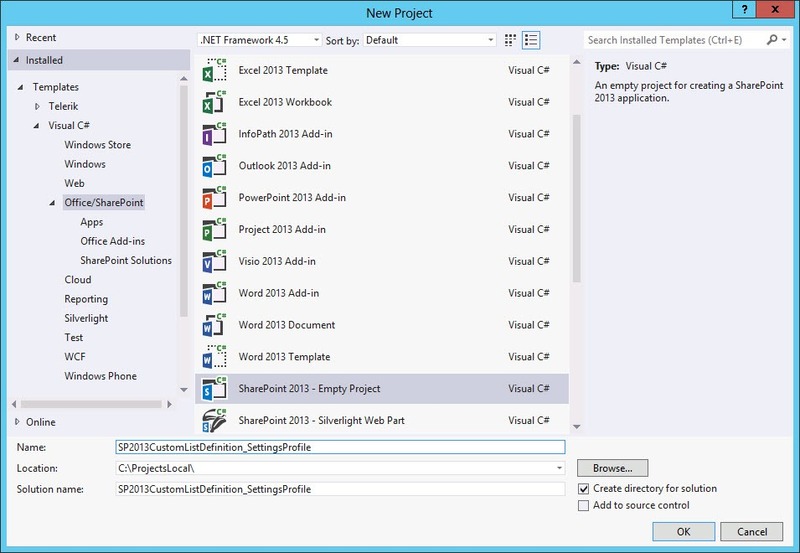 Job complete, in this article we went through creating a list definition using the Visual Studio 2012 SharePoint 2013 List project template. We manually deleted the default list instance files so that we were just left with the list definition in our solution. 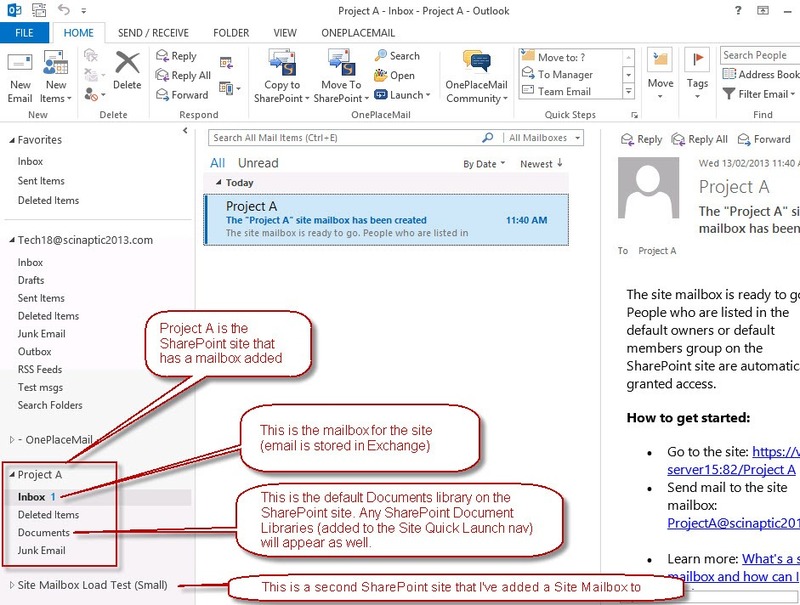 In this previous blog post SharePoint Site Mailbox integration with Outlook – A new way to get email into SharePoint, I introduced the new SharePoint Site Mailbox concept introduced in SharePoint/Exchange/Outlook 2013 and took a look the pros and cons of using this new feature. 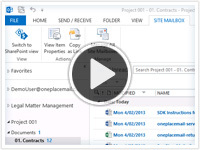 The following short videos show how OnePlaceMail 6.4 builds on the SharePoint Site Mailbox concept to deliver an enhanced user experience that overcomes many of the limitations or short comings of Site Mailboxes. 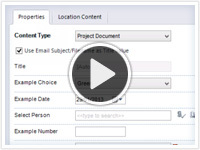 This video demonstrates how to extend Site Mailboxes in SharePoint 2013 to capture email attributes when saving email messages or email attachments. 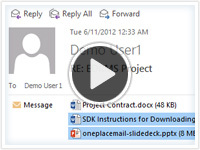 This video demonstrates how to tag content with custom metadata when saving email or email attachments to SharePoint Site Mailboxes from Outlook 2013. This video demonstrates saving from Windows File Explorer and Microsoft Office (Word, Excel & PowerPoint) into SharePoint Site Mailboxes. 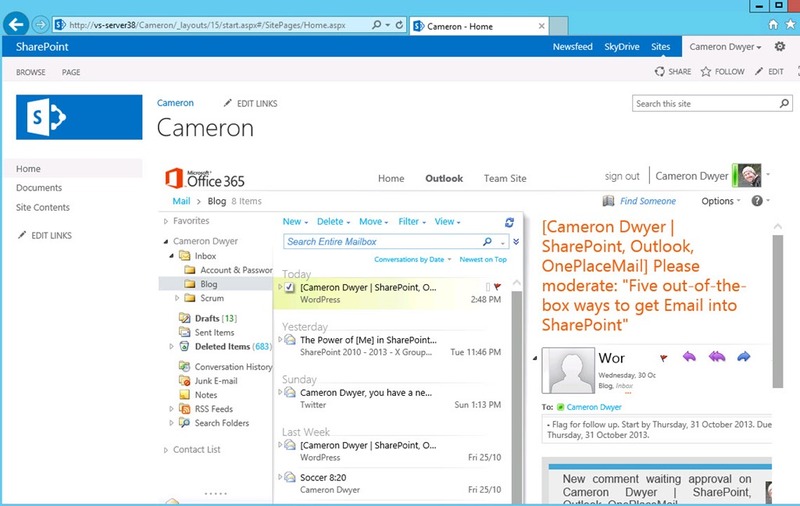 This video demonstrates how to access SharePoint from within an Outlook 2013 Site Mailbox. The demonstration also shows toggling between the Site Mailbox Exchange Style view and SharePoint View of the current location. 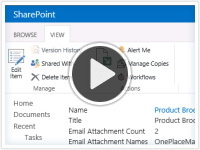 This video demonstrates how to replace email attachments with links to items in SharePoint. 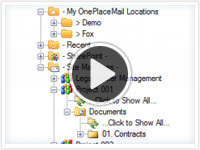 The video also demonstrates searching SharePoint, include Site Mailboxes to insert or add. 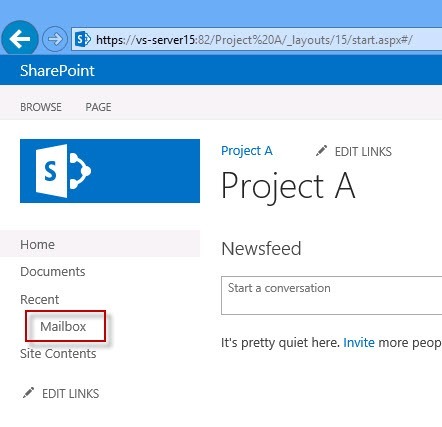 What are SharePoint Site Mailboxes? 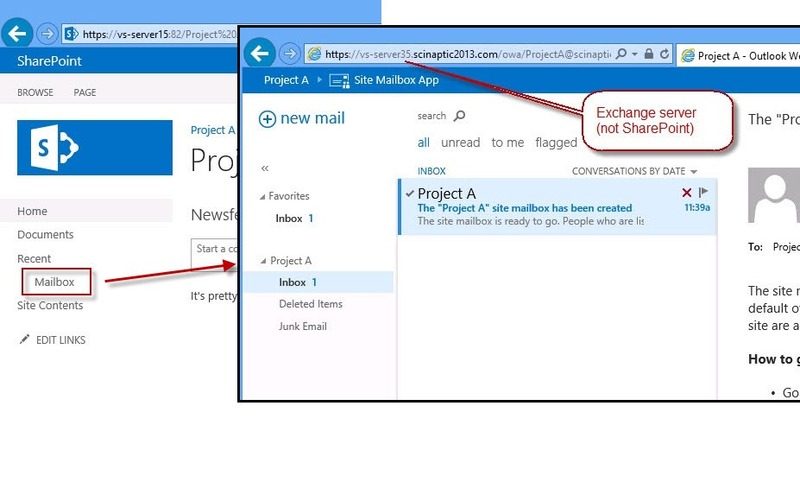 The SharePoint Site Mailbox concept is aimed at bringing Exchange emails and SharePoint documents together. So how does it do this? A site mailbox can be created at a site level (maximum of 1 mailbox per site). 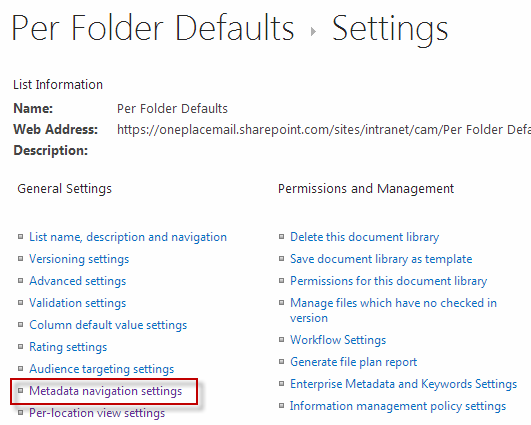 From a navigation point of view the mailbox appears just as though it is another list or library in the SharePoint site. When you click on the Mailbox link things aren’t as nice and integrated as you would hope. 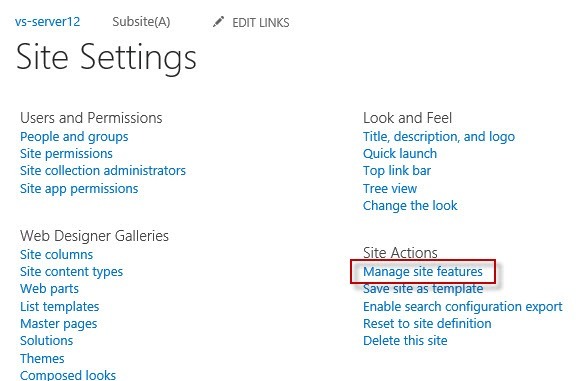 Instead of showing the content of the mailbox within the SharePoint site, as you would the content from a Document Library or List, rather the link simply opens the Site Mailbox in Outlook Web Access. You are taken away from SharePoint to see the content of the Site Mailbox. This now starts to give you an understanding of what’s happening under the covers. 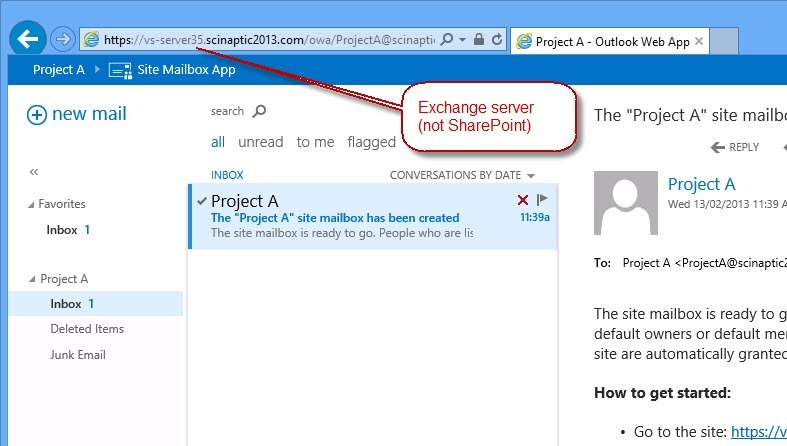 When you add a Site Mailbox to a SharePoint site, you are effectively creating a mailbox on the Exchange server and then your site gets a link placed on it. What is nice, is that the security of the mailbox is tied to the security permissions of your SharePoint site. So if you add or remove a user from your SharePoint site, the appropriate permissions are granted/revoked from the mailbox in Exchange as well. This is pretty cool. 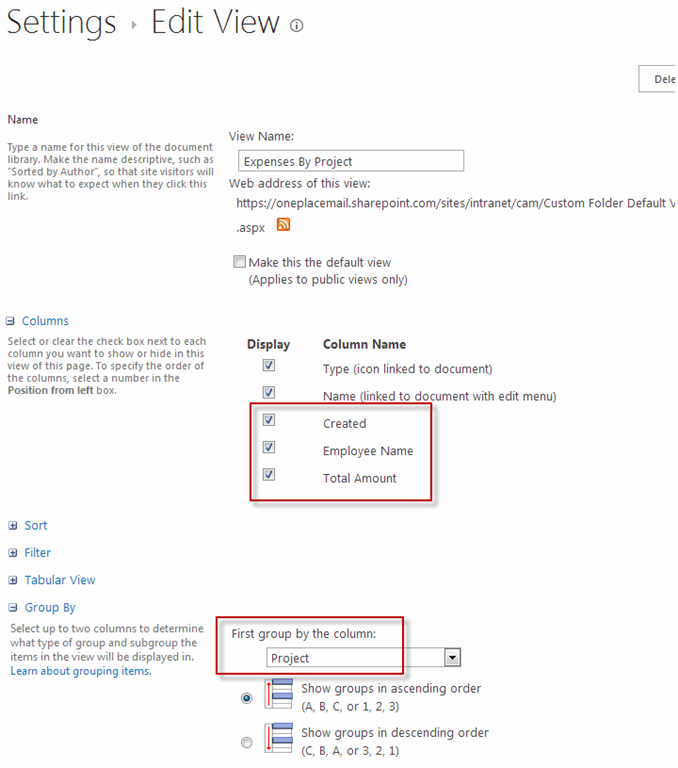 Exchange and SharePoint perform a synchronization to make this possible and stubs (not the actual file content) is stored in Exchange to make this view possible. 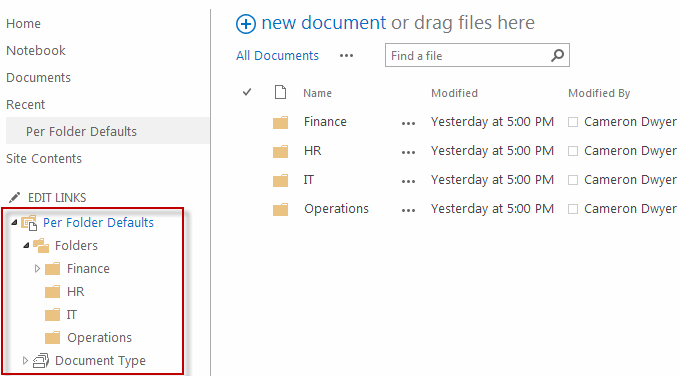 Clicking on these items in the Outlook view to open them up then communicates directly to SharePoint to download and open the file. Subfolders, both within the mailbox and within document libraries are supported. Read more about what Microsoft has to say on SharePoint Site Mailboxes. So now you have a basic grounding in what this integration looks like, what are the benefits and limitations of Site Mailboxes. Site Mailboxes Aren’t for You – Need a Different Option? For alternate methods of getting email into SharePoint please refer to my article (written based on SharePoint 2010 options) Five out-of-the-box ways to get Email into SharePoint. SharePoint Site Mailboxes provide many benefits and also have their limitations. This White Paper: SharePoint 2013 Site Mailboxes – Overcome their Limitations looks at Site Mailboxes and how they can be extended to implement broader solutions on the SharePoint platform. The worldwide SharePoint Conference for 2012 (SPC12) is almost upon us. We are expecting this years conference to be massive with the new Wave 15 of technology having now having been release to manufacture by Microsoft. So we go into this conference with SharePoint 2013, Office 2013, Exchange 2013, Windows 8 all ready for production. Expect plenty of awesome sessions showcasing the power and opportunities that the new wave of technology brings with it. The OnePlaceMail Team have been incredibly busy in preparation for this event with the new OnePlaceMail product ready to go straight into SharePoint 2013 / Office 2013 / Exchange 2013 production environments. This is welcome news to our early adoptors, those of you who have been using OnePlaceMail against the Preview software and in TAP environments, and are looking to go straight into production with 2013. You will find the OnePlaceMail Team at booth #1046 in the Exhibition Hall where we will be running live demos of OnePlaceMail on the new technology. Of course we will have giveaways and competitions so you don’t leave the conference empty handed. I look forward to meeting new friends, talking SharePoint and enjoying a SharePint or two. I’ve recently run into performance issues with my new SharePoint 2013 Preview development environment. A quick investigation in Task Manager highlight Memory usage as my issue. The culprit processes are Microsoft Office 2013 component. I see SharePoint 2013 is somehow behind my issue. 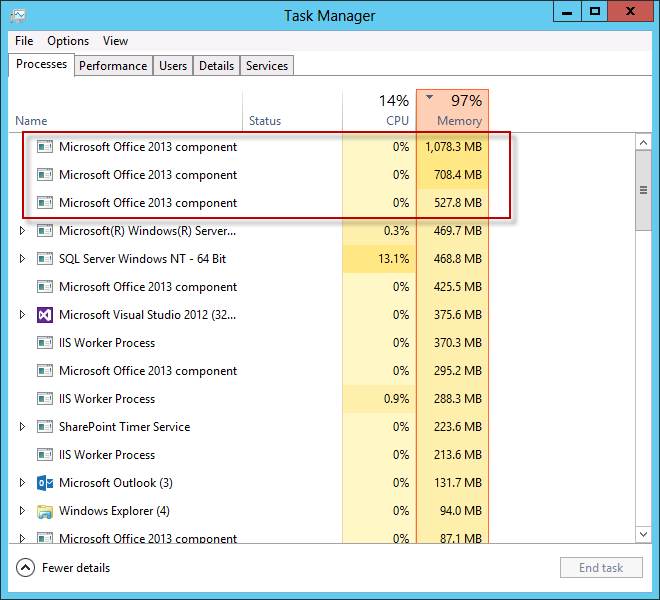 What are these Microsoft Office 2013 components and why are they consuming so much memory? 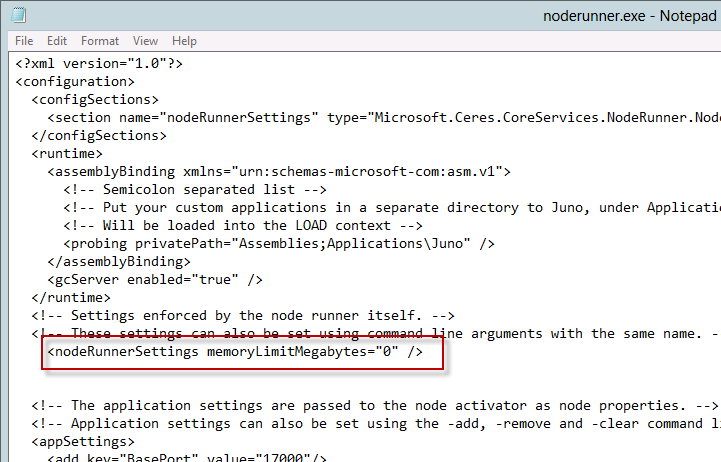 This article attributes the issue to a memory leak in the SharePoint 2013 Preview Search Service. 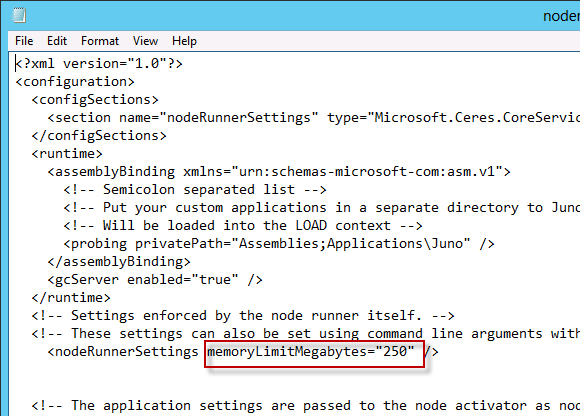 Provide a memory limit for the noderunner process, I set the limit at 250 as shown below. After making these changes I recommend you restart your server. Although I have had no problem with just killing the noderunner.exe processes in Task Manager; SharePoint creates them again almost immediately. 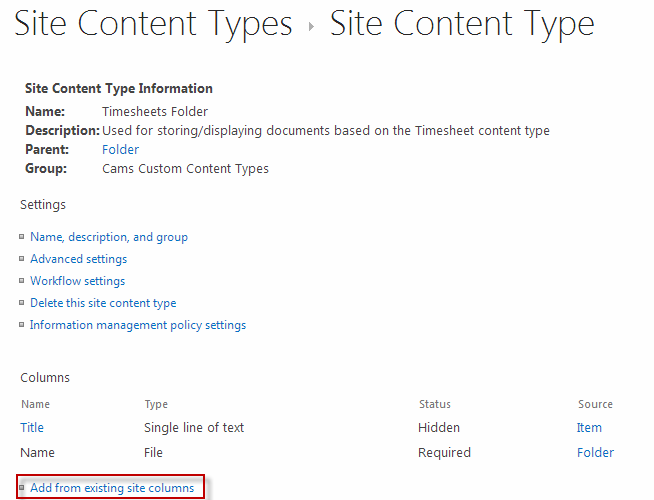 Keep in mind this fix is suggested for SharePoint 2013 Preview only, I’m hoping the bug will be fixed for RTM.